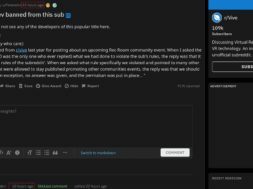 One of the largest subreddit communities for VR — r/Vive — is currently in flux as a huge clash between the community and the main mod u/500500 have surfaced. 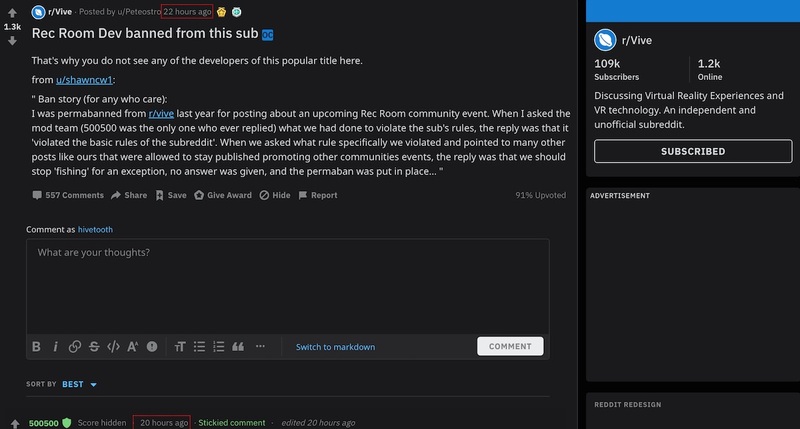 u/500500 has been swiftly banning many developers and professionals in the VR industry such as HTC Vive employees, one of the Rec Room developers, and many other indie developers. The r/Vive community currently has over 109,000 members and is one of the most subscribed communities on Reddit for VR related content. However, with u/500500’s unorthodox banning in the r/Vive subreddit, many of the community members have asked him to remove himself from the moderator position. All the bans that you post here are ones that I am very happy about. They have good reasons that the developer is never forthcoming about and does not represent very well…” You can see his full statement here. Also, with this heavy backlash from the community, many of the members have decided to part ways with the subreddit and start a new community under r/vive_vr. In a matter of 24 hours, the community has grown to over 13.5k members with many redditors leaving the r/Vive community. r/Vive has actually lost thousands of users over the course of the day. next Biathlon Battle VR - Is It Worth A Shot?